Janet Goldberg McEnery is Board Certified by the Florida Bar in Labor & Employment Law and licensed in Missouri, Illinois and Florida. She represents private, public and non-profit employers in labor, employment discrimination, minimum wage/overtime, employment contract, and whistleblower claims. For over 25 years, Janet has represented businesses, hospitals, medical practices, restaurants, hotels, wagering facilities, manufacturers, financial institutions, government contractors, municipalities, landscape contractors, insurance companies, independent insurance agencies, and educational institutions in the defense of employment and labor relations matters. 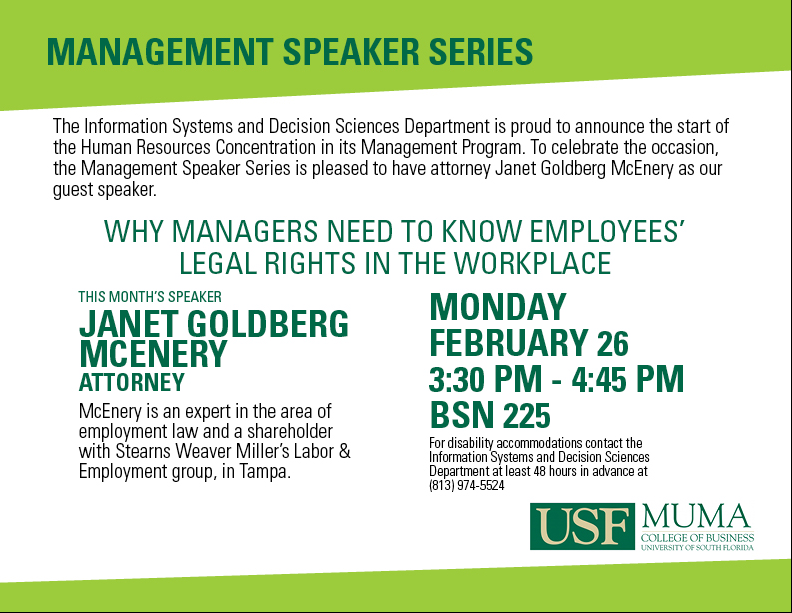 Janet is a frequent lecturer and author on a wide variety of topics related to Labor & Employment Law. She also provides interactive training for firm clients on such topics as preventing harassment and discrimination claims and complying with wage and hour laws. Defends discrimination and wrongful discharge claims through jury trial. Represents employers before the NLRB, the EEOC, and in Department of Labor and DHS and DOJ audits. Advises employers on union-related issues. Represents employers in arbitration and collective bargaining. Handles affirmative action issues, drafts AAPs and represents employers in OFCCP reviews. Develops drug-testing and other policies. Advises employers about new legislation. Counsels and litigates confidentiality and non-compete agreements. Defends places of public accommodation against ADA Title III accessibility lawsuits. Defends lending institutions against fair lending discrimination claims. Counsels employers regarding reductions in force, severance issues and compliance with plant closing laws. Successfully litigated one of the first W.A.R.N. Act cases, through an appeal to the Third Circuit. Events: Employment Law and Health Issues: Chemical Sensitivities, Bed Bugs, Zika and Flu Shots, Oh My! Events: Breaking Up is Now Harder to Do! Publications: Happy Holidays, or is it? Steering Clear of Religious Discrimination and other Landmines during the Holidays! Events: Is Your Website ADA Accessible? Events: Promises Made in Severance Agreements: What Do They Mean, Why are They There, and Are They Legal? Firm Announcements: Janet Goldberg McEnery and Andrew W. McLaughlin Have Joined Our Labor & Employment Law Group in Tampa.